While your children are growing and maturing the nutrients they consume play a critical role in ensuring not only robust health but also their proper development both physically and mentally. Specifically Designed for Children – Although vitamins and minerals are the cornerstone of this multi, a uniquely tailored array of essential fatty acids, whole fruit and vegetable concentrates, digestive enzymes and green food concentrates allow this formulation to address a number of additional nutritional challenges that our children face. Divided Doses – Our bodies aren’t designed to be nourished in one large dose once a day. Without question, smaller more frequent meals allows for better utilization of the nutritional value of our food. The same applies to the vitamin supplements that we consume. As well, a number of nutrients have relatively short life spans in our system and need to be replenished more often than once a day. Professionally Formulated – The Progressive Chewable Multi for Kids was formulated with the assistance of a renowned naturopathic doctor. Each component was chosen for its compatibility and harmony within the entire formulation. This, in turn offers great nutrition for kids, and peace of mind for parents. Naturally Flavoured and Sweetened – Many popular children’s multi’s contain large amounts of sugar and are unfortunately both artificially flavored and colored. In contrast, our children’s multi contains a combination of natural berry flavors and is sweetened with a blend of pure ingredients that includes honey powder and organic maple syrup. Although a balanced diet provides a sound nutritional base, a high quality multivitamin supplement offers additional essential nutrients in a form specifically designed to target the health needs of a developing child. Research has shown that children with better nutritional habits experience improved developmental growth, mental and physical function, as well as an increased immune response. A multivitamin supplement is critical in the formative years as children do not normally eat enough of the foods (fruits and vegetables) that provide them with the much needed vitamins and minerals for optimal growth and development. Unfortunately, our children are constantly exposed to visually enticing but nutritionally deficient refined, fried, fast, junk food, snacks and soft drinks. Even the most nutritionally vigilant parent cannot be 100% certain what nutrients are in the foods that their children consume. 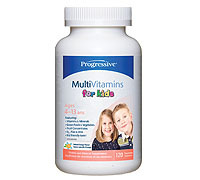 Progressive Chewable Multi for Kids offers a comprehensive strategy for supporting the unique nutritional needs of active children. It features a synergistic combination of vitamins, minerals, essential fatty acids, and fruit and vegetable concentrates in a delicious, natural summer berry flavour. Divided doses allow for moderate potencies to be taken more frequently for improved absorption. Progressive Chewable Multi for Kids contains no artificial flavours, colours, or sweeteners, and has no hidden ingredients. This, in turn offers great nutrition for kids and peace of mind for parents. Progressive Nutritional Therapies Vitamin and Mineral Supplements are manufactured in Canada in a GMP certified facility and use only the finest quality raw materials from around the world. With our extensively researched ingredients, finely detailed formulations, and 100% quality assurance we are determined to bring you the most effective formulas possible, and will continue to make every effort to bring you new ideas and offer you new choices. Ester C with Bioflavonoids – this patented form of calcium ascorbate offers greater absorption and retention than all other forms of vitamin C. It has a neutral pH (non-acidic) and will have a longer lifespan in your child’s system. Bioflavonoids work synergistically with Ester C for increased antioxidant and immune support. Mineral Citrates – only a small percentage of the minerals that we normally consume are actually absorbed and utilized by our bodies. However, minerals in citrate form have a much higher absorption rate are transported into our cells far more efficiently. Green Food Concentrates – this comprehensive combination of highly alkaline, nutrient-rich green foods includes alfalfa, spirulina, spinach, wheat grass and wakame. These concentrates improve the pH of the body and detoxify impurities normally found in a child’s highly processed (acidic) diet. These health-promoting foods are often not consumed by kids because of their taste. Digestive Support – these include the plant-based digestive enzymes bromelain and papain, as well as Bioperine® the patented piperine extract that improves the passage of nutrients across the intestinal wall and into the blood stream, thus increasing the absorption of the entire formula. Fruit & Vegetable Concentrates – this unique blend of whole food concentrates includes acerola berries, cranberries, blueberries, kiwi, pineapple, papaya, carrot, kale, kelp, broccoli and tomato. Each of these components provides potent antioxidant protection to fend off free radicals, support healthy immune function and protect a child’s body against disease. EFA Complex – the essential fatty acids found in flax seed, sunflower (CLA), and fish oils play a very important role in maintaining healthy immune, cardiovascular and brain function. In children, EFAs are especially beneficial for improving focus and concentration, and sharpening mental acuity. 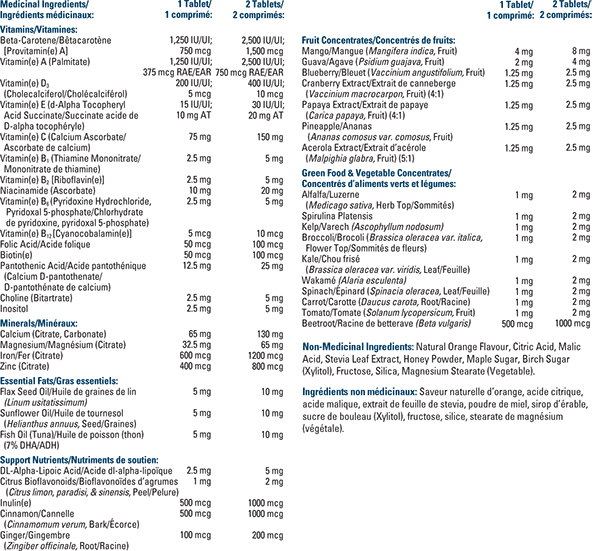 Children (age 9−13 years): Chew 1 tablet with breakfast and 1 tablet with dinner for a total of 2 tablets per day, or as recommended by a health care practitioner.